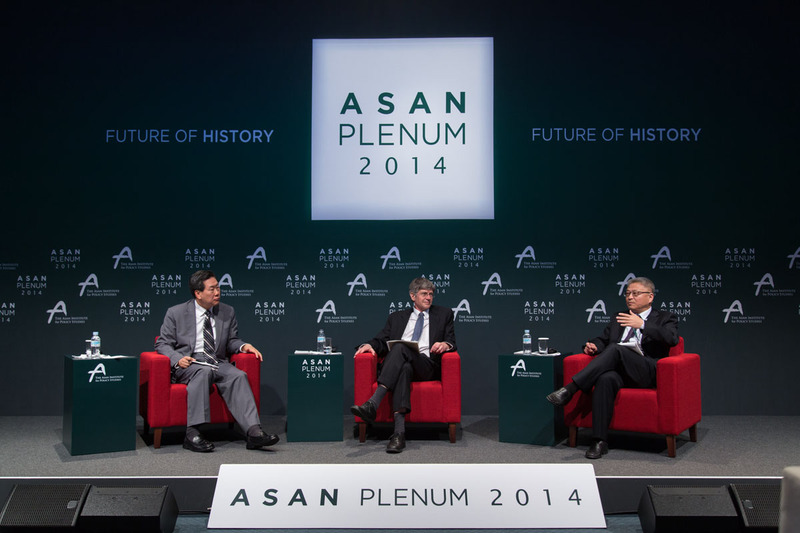 Dark shadows hung over this year’s Asan Plenum. Wearing yellow ribbons and also observing moments of silence, the participants were in a somber mood owing to the sinking of the Sewol and the futile search for survivors still under way. The theme of the gathering did little to lighten the atmosphere. Despite brief references to more positive precedents, most examples of lessons to be drawn from history cited past times of failed diplomacy or of developments once per ceived as successes but now seen as missed opportunities. Recalled were the dates of anniversaries likely to be remembered in 2014/2015: 1894—the Sino-Japanese War; 1914—the First World War; 1945—the end of the Second World War; 1965—the normalization of South Korean-Japanese relations, now deemed to have left critical issues unresolved; and 1989—once celebrated as the “end of history,” but now seen as a time when East Asia and the world were left with festering wounds. Sandwiched between the fear of war erupting in Ukraine, breaking down the post Cold War Euro-Atlantic order, and preparations for a fourth nuclear test in nearby North Korea, referred to as a “game-changer” in the Asia-Pacific, the plenum struggled to look ahead to light at the end of the tunnel instead of back to depressing memories now regaining their relevance. Fortunately, the plenum was not mired in tedious exhortations for one country or another—usually Japan—to stop doing what it has been doing in order to avoid the fate of those who do not learn the lessons of history being doomed to repeat it. On the contrary, exchanges of views on one panel after another generally assumed a basic awareness of recent events and precedents and concentrated on generating ideas for moving ahead with some prospect of success. The result was an uplifting marriage of academic and think tank rigor—the tempering judgment of diplomatic experience mixed with sustained journalistic inquisitiveness against the backdrop of historical analogies. When on occasion this constructive mood was interrupted by the fireworks of mutual recriminations between China and Japan or South Korea and Japan, it was not long before the plenum’s search for the high ground resumed. Yet, never far from the surface was the unbridgeable divide between two clearly expressed narratives: the US one calling for common ground or confidence-building measures through transparency; and the Chinese one demanding one-sided retreat from policies such as support for Japan, pressure on North Korea, and the rebalance. Many participants cited examples from the past to help Beijing and Washington find a better way forward, but Chinese panelists rarely engaged in such historical quests. This synopsis does not cover the entire range of panels and keynote addresses over two days. Rather, it selectively draws on discussions with special relevance to new diplomacy centering on Northeast Asia, recognizing the exchange of views about Sino-US relations as most critical. We start with ROK Foreign Minister Yun Byonse’s keynote address, followed by a plenary exchange between James Steinberg and Yan Xuetong moderated by Hahm Chaibong. Looking back to history, they set the tone for later panels. Readers can turn to the summaries of panels and also the full record of the proceedings to learn who said what. Our goal is to interpret the thrust of some of the exchanges by tracing certain recurring themes over the course of the plenum. Foreign Minister Yun pointed to four main challenges: 1) geopolitics, linked to the territorial conflicts in the region with potential for the post-Cold War era to repeat the failure of the two-decade interlude between world wars; 2) the weakness of the global economic order still shaky long after the 2008 crisis with awareness that high levels of economic interdependence did not prevent World War I; 3) the challenge of global governance, including terrorism and climate change, creating unprecedented demands for cooperation never seen in earlier times ; and 4) the challenge of human security, including sectarian conflicts and human rights abuses, to which the world community is more sensitive than ever before. Yun put both Northeast Asia and the Korean Peninsula at the vortex of these forces, drawing on historical precedents associated with the past fate of Korea to link power politics and diplomacy. In light of this address, plenum attendees were challenged to explain how their ideas would help to overcome looming dangers, learning from the sobering lessons of history. Yun was explicit in his admonitions about the Korean Peninsula, where the Cold War did not come to an end and history points to the importance of diplomacy in order to avoid being overwhelmed by the choices of the major stakeholders. He sees it as ground zero for some of the fiercest conflicts of both hot and cold wars with only brief opportunities to intensify diplomacy, and now as an area that is feeling most palpably the effects of the “return of history.” Yun proceeded to list policies of President Park Geun-hye that respond to the challenges of history, mentioning her vision of a unified Korea, trustpolitik, the Northeast Asia Peace and Cooperation Initiative, and her Eurasian initiative and new participation in a group of advanced middle powers, reaching beyond Northeast Asia. He suggested that Seoul now has a significant role in diplomacy, as it strives for the “end of history” on the peninsula. What he, as foreign minister, did not address were the difficult diplomatic choices looming, given rising tensions between Beijing and Tokyo as well as Washington, and the new breakdown in US-Russia relations—themes that others soon raised. In the exchange between Steinberg and Yan, we find the big sweep of history in their purview, as five themes kept recurring: 1) the Cold War analogy with linkages to Sino-US relations and to Russia today; 2) a power transition, again pointing to Sino-US relations but drawing on different precedents, notably before WWI; 3) historical narratives and the difficulty of reconciling them, as in China’s century of humiliation theme seen in Xi Jinping’s “China Dream,” and the US self-image as an indispensable nation, serving as a force for peace, security, and provision of public goods; 4) the challenge of a security dilemma, which leads both countries to feel more insecure unless they can find a way to make their intentions transparent to the other, as was the case in much of the Cold War; and 5) the intensification of nationalist emotions, whose impact in history can be seen in states obsessed with defending their national pride failing to find common ground. The panel concentrated on putting Sino-US relations in historical context, but Abe Shinzo, Taiwan, and South Korea’s position between Washington and Beijing quickly emerged as subjects of audience interest. Yan’s analysis with a high degree of certainty about comparisons with the Cold War era drew considerable scrutiny. Whereas Steinberg pointed to IR theory and history as reasons for pessimism about managing the great power transition, Yan presented an optimistic scenario of no hot or cold war in the coming decade, arguing that both ideology and a nuclear arms race, which were the drivers of the Cold War, are not present in Sino-US relations. Steinberg took a skeptical approach and Yan a rosy view of the impact of the Xi-Obama agreement on forging a “new type of major power relations,” as Steinberg cited a lack of transparency in Chinese decisions, in contrast to Yan merely finding it sufficient that Obama accepted Xi’s concept. When Steinberg warned of the danger of failing to realize that a red line has been crossed, as during the Korean War, Yan avoided the subject of potential confrontations in hot spots. For Yan, only Abe is calling for an ideological alliance, but Obama has rejected that. He even argues that Putin is not being ideological in his behavior in Europe. Such narrow reasoning about ideology, omitting consideration of national identities, left many looking for more depth, not simple analogies without recognizing that the emotions of nationalism are not due only to ideology or that arms races need not be nuclear. Finding specific differences with the Cold War G2, Yan found no parallel. Yan’s interpretation of the power of common interests linked to globalization with no implications for improving mutual trust is a twist on liberal theory. Yes, growing economic interdependence and diversification of markets reduces the chance of a hot or cold war, but for Yan it does not reduce the predominance of competition over cooperation or lead to the spread of international institutions based on trust. He argued that the United States and European states would not fight Russia due to economic interdependence and China would not use economic weapons against Japan, whose companies could turn to Southeast Asia or other partners. Discussants observed that such interdependence has failed before, as in 1914, that the Internet is arousing national identity with similar divides as over Cold War ideologies, and that the arms race is occurring in cyberspace, maritime buildups, and new weapons with dangerous effects in exacerbating the security dilemma despite Yan’s claim that trust does not matter. It became clear that Yan was arguing that China need not feel constrained because the United States knows it cannot win and is constrained even as the economic and military competition is intensifying. Whereas Steinberg finds the increasing clash of two narratives a danger worth striving to head off, Yan limits his structural analysis to unprecedented economic integration that allows China to ignore such potential problems and count on a deductive logic for continued peace. In choosing between Steinberg and Yan’s reasoning, members of the audience posed questions indicating different assumptions about how the international order was being disrupted with contrasting historical parallels. One questioner took a Chinese position, asking if the problem was not the US rebalance, which had destabilized the relations among big powers and threatened world peace. Was this not another case of an established power refusing to accept a rising power? Yan elaborated on this point charging that: Western pressure on Russia is driving it to China; US support for Abe is reinforcing an anti-humanist, aggressive force reminiscent of an earlier age, which should be isolated; US refusal to resume the Six-Party Talks is failing to work with China on a format that can work; and China’s recognition that increased economic ties with Taiwan do not suffice for national unification means that military power may be the only way to stop Taiwan independence since Taiwanese national identity is preventing the spread of Chinese national identity there. Without citing specific historical examples, the Chinese position was presented as an innocent new power being blocked at every turn and having no need to adjust its own policies. In summarizing his view of Russia’s impact, Yan argued that Russia is not now a global power and is not causing more than a regional problem; so the US response will not deflect if from its rebalance focusing on China, which should be the primary focus. Much of the discussion centered on challenging the Chinese arguments. Rather than Russian innocence, it was argued that Putin’s revival of nineteenth-century thinking (the traditional logic of protecting one’s nationals allegedly discriminated against abroad, even by means of war) is testing the international community and should elicit Chinese condemnation. There was no indication of Chinese interest in viewing Putin’s behavior as a problem. Also, in response to the criticism of the rebalance, it was stated that all, including China, benefit from the US alliances, to the point that China’s rise in the absence of the US presence would prove highly destabilizing. No sign of similar thinking from Chinese commentators emerged, as Yan led the way in taking a zero-sum approach insistent on US retreat, but couching his argument in a win-win facade, as if yielding to one-sided demands is wholly in the US interest. Clashing views were apparent in discussions of the impact of hypernationalism—a growing source of risk as in earlier historical periods or a natural product of human beings as social animals seeking group loyalty and positive for the international political system—; of China’s prospect of reverting to threats of force toward Taiwan; and of the impact of demonizing Abe and seeking to intimidate Japan, which tests the limits of US tolerance. The greatest worry seemed to be that the reasoning on display from China, including the possibility that US caution in responding to the aggression of Russia in Ukraine could be misinterpreted as meaning a similar stance would occur in a crisis over the Senkaku (Diaoyu) Islands. Despite efforts to impress upon the Chinese the danger of miscalculations and urgency of recognizing parallels with past global developments that brought war, Yan did not recognize such lessons. The upshot of the discussion was a sense that Chinese were pressing for a US retreat to leave other countries alone with it in an unequal relationship rather than serious efforts to manage the evolving rising power and established power relationship. The gap between how China is conceptualizing today’s intense competition with the United States and also Japan—no Cold War, no historical parallel except the revival of Japanese militarism and US anti-communist containment thinking—, and how the other plenum participants are viewing it was unmistakable at many of the panels. On the one hand, Chinese panelists cited David Kang’s work and other sources that suggest a benign past in Asia is also Asia’s future with China’s rise. As long as the United States recognizes the wisdom of not insisting on being a dominating power, China will not be one, and the region will be stable. Along the same lines, audiences heard that the more assertive US posture in the region is not due to new territorial tensions or North Korea’s behavior, but, despite assurances to the contrary, aims to contain China. On North Korea, since there is no military path to denuclearization and regime change cannot be an objective, the United States should defer to China’s approach to negotiations. It should also consider the security concerns of China and Russia, having awakened to the consequences of NATO expansion, not build up its Asian defense ties, respect China’s core interests, and relieve its concerns. There was no hint of what China might do differently. History served as a warning to many other participants, but Chinese presenters were loath to reflect on its relevance. In the exchanges over Chinese reasoning, Japan and the Korean Peninsula figured as examples for which many participants were seeking a sign of new seriousness about diffusing tensions, but the Chinese speakers were not so inclined. They gave no hint of what China might do differently if, as expected, North Korea tests a fourth nuclear weapon. There was no indication of historical parallels for the case of a belligerent country acquiring more threatening weapons and how other countries have reacted. While others warned of the danger of nationalism, there was no sign that speakers from China consider emotional nationalism toward Japan a problem. Indeed, the main talking point is that Japan broke the status quo by nationalizing the islands, and it must change course without joint measures to reduce the risk of conflict. In contrast to the Chinese comments, there were many attempts by others to find a way ahead that could reduce the risk of repeating one or another dire past outcome. This was generally not a realist discussion of relative power and threats or a liberal assessment of more economic interdependence and multilateral institutions, but a protracted search for greater transparency, reduced misperceptions, renewed trust, and narrowed gaps in national identities. If Chinese accusations of anti-communism and ideological insistence on democratization left little room for common ground as they also centered on national identities, others focused on practical cooperation to increase trust and lower the volume of identity rhetoric. They were often reluctant to follow China’s lead in establishing high-sounding principles with vague content rather than working to increase trust incrementally. As in the Cold War, confidence-building measures were deemed essential for the avoidance of conflict, establishing habits of cooperation. Many specific agreements had been reached between Moscow and Washington, and it was these precedents that speakers cited in calling for steps to increase predictability and to reduce the danger of accidents. The Cold War stood as an example of how to avoid a hot war more than as something to be avoided. This was a reflection of the recent spread of pessimism about managing Russia’s actions, agreeing on how to curtail North Korea’s aggressive moves, and realizing the goals of the Obama-Xi summit of 2013, as troubled ROK-Japanese ties cast a shadow too. Whether Chinese were misperceiving US intentions or duplicitously misidentifying them, some speakers sought to explain them in ways that could facilitate increased trust. They insisted that the record of recent decades and the Obama administration too is one of accepting China’s rise and welcoming it into the international system, disputing charges of containment, as seen in the WTO and in the openness of TPP to China. This contrasts with China’s desire to exclude the United States through new regional institutions. Unacknowledged in Chinese statements is the actual division between Asia-Pacific and exclusively Asian multilateralism, with more neighbors of China now insistent on the former, obliging Chinese to acknowledge the negative consequences of continuing to insist on regionalism exclusive of the United States. Yet, no such acknowledgment occurred. This was one example of a dearth of open debate or forthright recognition of issues that others thought need to be aired. A persistent interest of participants was building trust. Whereas commentators from many countries indicated that Washington is striving to build trust and not standing in the way when states such as South Korea improve their ties to China, no evidence was presented on how China is building trust. Instead, some warned that China has been trying to dictate to others regarding their security ties, aiming to rip asunder relations with the United States in order to expose states to a one-on-one bilateral relationship with China, which, in essence, would duplicate the hierarchical tributary system of old. This fails to increase trust, ignoring past lessons about rising powers respecting restraints, at least until the balance of power has clearly shifted. Discussion of history encompassed references to models of international relations. Instead of popular themes such as rising multipolarity or reviving bipolarity, there was a suggestion of dynamic equilibrium. The status quo is fading, many agreed, as a demilitarized Japan and an offshore balancing United States are deemed inadequate for new security challenges. Yet, no collective security agreement seems possible. This leads to reinvigoration of the US alliances and partnerships dating from the Cold War. Given the failure of China to make Japan or others feel secure or to make clear its intentions on its periphery and in territorial disputes, it is not surprising that the United States and others do not welcome a militarily stronger China. The Monroe Doctrine loomed as an historical example, suggestive of China pushing out other powers from its reputed sphere of influence. Another view was that emerging technologies for surveillance, cyber attacks, and space do not lend themselves to a security agreement. Whether lessons of the past are being ignored or challenges of our times are proving too difficult, security cooperation did not appear promising. Given intensification of US-led bipolarity, what accounts for different combinations of multipolarity inclusive of China, it was asked. It is not merely a function of how militarily dependent a state is on the United States, for, it was noted. South Korea is more independent in its foreign policy than is Japan. The nature of the perceived threat matters. For Seoul it is North Korea, a continental challenge, for which China exerts an outside and mixed influence. Whereas, for Tokyo it is a maritime threat, for which China is the source of the military buildup. Thus, Japan sees multilateral security as an extension of its US alliance, unlike South Korea. Yet, the two spheres are not entirely separate. Washington wants to draw Seoul into the maritime one, and Seoul is concerned that Tokyo may expand the right of collective self-defense to suit the ideological right and leave Koreans nervous about new Japanese militarism. There were hints at the plenum of Sino-US-South Korean secret cooperation on how the future of North Korea will be addressed. This implied that the regional security dilemma is not so serious. Other Chinese comments suggested that economics still is the top priority, not territorial disputes, Rather than focusing on historical lessons or confidence-building measures, such comments downplayed urgency for them. In South Korean comments there was also lesser urgency about problems other than North Korea, justifying triangularity with the United States and Japan only in regard to the North but opposing what could become an Asian NATO. This logic supports a skeptical view of the need for Japan to build its offensive capability, as if there is an easy divide to be drawn between deterrence and war-fighting capacity. A Japanese response was that Japan’s territorial waters have been invaded, which would lead any country to add to its military strength, while Japanese naval vessels do not enter the disputed waters around Dokdo/Takeshima, showing Japan’s defensive outlook. Separate panels focused on differences in thinking not centered on Chinese and US behavior. For Northeast Asian issues, this primarily meant the Korean-Japanese divide over history, ranging well beyond memories of the war and occupation era, and multiple views of North Korea and the power shift under way in East Asia. One contrast was between those who treated these issues as essentially subsets of the polarization occurring in the region or so distinctive as to not have much impact on this widening gulf between China and the US-led alliances and partnerships. Some wanted to elevate the Korean-Japanese divide into something of comparable import. Some wanted to find room for multipolarity, allowing more space for other states to flex their diplomacy if not power. Some sought to see in the North Korean challenge a different pathway for the region, as China joined in collective security measures as well as intensified diplomacy. Yet, the overall impression was of a continuing thread of narrative that left little room for these themes to gain traction. As would be clear in Obama’s travel to four countries, including South Korea, during and just after the plenum, it is Sino-US relations that now draw the spotlight and elicit analyses aimed at learning from the past. Nothing in Obama’s trip would require reassessment of what many regard as a sharp turn in the geopolitics of the Asia-Pacific region.